Most leather work was originally carried out in small workshops, usually by men, often in a yard behind a house. Most businesses were small, employing between one and three people. All that was required to carry out the work was a few inexpensive hand tools such as hammers, knives, pincers, and a pricking iron. Curriers used a two handled knife to shave the leather to the required thickness. Most of the tools were produced in the town so that Walsall’s leather trade became almost self-sufficient. By the middle of the 19th century, leather factories had appeared, which employed men, women and children. Within twenty years large numbers of women worked in the industry. In the late 1860s around sixty percent of the workforce in bridle and harness making were women, and around thirty percent of saddlery workers were women. The development of the sewing machine in the 1850s greatly changed manufacturing. It led to larger workshops, and increased production. In the 19th century the industry thrived because of the expanding number of working horses in Britain, and an increasing demand for saddlery and harnesses from abroad, particularly from the USA, India, Australia, New Zealand, and South America. The local factories benefited greatly by the coming of the railways, which enabled products to be quickly and efficiently sent to destinations all over the country, including sea ports where goods could be loaded onto ships for export. An advert from 1899. After 1870 the leather manufacturers suffered because of competition from Germany, and falling markets in Europe. Another threat was the introduction of the motor car. The innovative industry responded by turning to the production of bicycle saddles, and upholstery, and fancy leatherwork for motor cars. Some of the old saddle makers and harness makers began to produce sports equipment and travel goods. Other manufacturers began to produce bags, purses, cigar cases, dog collars, and fancy leather, often for export. By 1910 there were eight tanneries and twenty seven curriers in the town which employed several hundred men. Leather was produced for shoes, cycle and motorcycle saddles, motor cars. One well known company, Boak, on the corner of Bridgeman Street and Station Street was producing fancy leather from calf, sheep, and goatskins. This firm is one of the largest in the kingdom for the production of leather, required for the manufacture of saddlery and harness, for upholstery, for coach building, and for other purposes. It was founded in 1819 by the late Mr. E. Holden, whose son is the present senior partner. The manufactory and warehouse are situated in Park Street, and are reached through a narrow passage adjoining the New Inns. What forty years ago were only one or two curriers' shops are now the largest works of the kind in Walsall; the latest additions are lofty five-storey buildings. They comprise offices, warehouses, depots for hides in various stages of manufacture, including scouring shops with a large scouring drum; compo houses, with ingenious mechanical appliances; splitting shops; finishing rooms; extensive drying sheds; rooms and sheds for polishing, for storage of oil, etc. ; also blacksmiths' and carpenters' shops. Here are produced all kinds of enamelled and japanned leather, harness hides, legging hides, horse hides, leather for military belts, winkers, bridles, reins, stirrups, bags, braces, straps, and fancy articles. A branch of manufacture requiring most careful attention is that of hogskins for racing saddles, for which lightness is so important a consideration. The tan yard is in Beith, Scotland. The goods are sent from Walsall to London and the provinces, and also to the continent and the colonies. Fancy leather goods produced in the early 20th century included blotters, footballs, garters, gloves, ladies' fancy bags, pocket books, razor strops, and watch guards. Around this time the cutting-out process was mechanised and several large businesses merged. 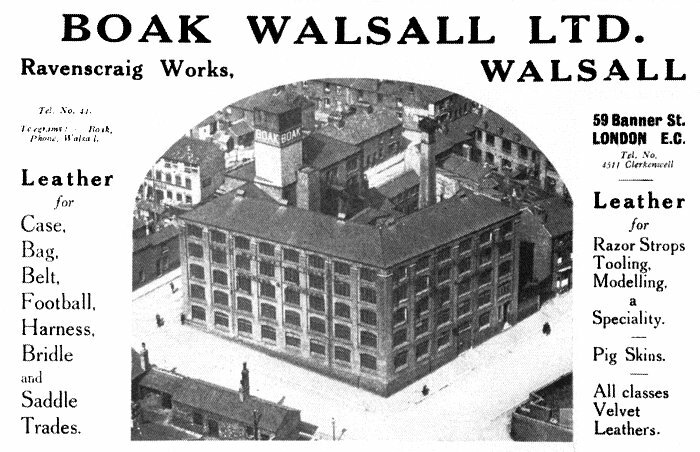 During the First World War the factories turned to munitions work, and after the war Walsall became one of the most important centres for the production of fancy, and light leather goods in the country. John Leckie & Company made saddles and leather goods at London Saddlery Works in Goodall Street. The firm also had London showrooms at 84 Fore Street. Products included saddles and harness, fancy leather goods, bags, cases, waist belts, leggings, leather scout and girl guide equipment, and footballs, which were sold at home and abroad. Walsall is chiefly noted as a saddlery town, and has become the centre of this industry. The export manufacturing business of this firm, founded nearly fifty years ago, was transferred from Glasgow to Walsall about twenty-five years ago. It had been in existence for many years in Scotland, where a large manufacturing business for foreign and colonial trade was carried on; but owing to the facilities for obtaining materials, machinery, and labour in Walsall, it was found more profitable to transfer the industry from Scotland. 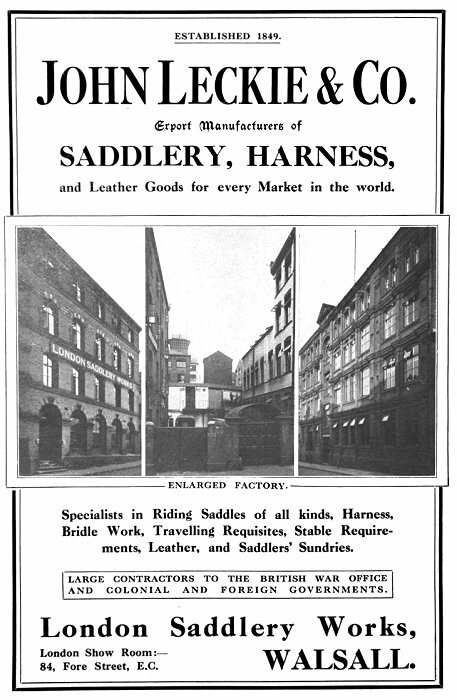 They are the largest manufacturers in the various branches of the Walsall leather industry, ladies' saddles, hunting saddles, harness, army equipment, belts, strapping, purses, and every kind of equestrian requirements for foreign and colonial travel, which are all classified and worked under different departments. The firm manufacture their own leather; and the hides after being tanned are put through different interesting processes before they become ready for use in different colours, textures, and strengths. In the cutting room the leather is cut up by hand or by gauge knives, or is placed under steam power cutting presses to be cut out into certain shapes, until gradually the articles get their final finish. The work is prepared for stitching by men and women; the hand stitching is done in one department by girls and women, whilst the plain stitching in most cases is done in the steam power machine-rooms, where there are about thirty machines, of all strengths and makes, both English and American, are continually stitching articles from the lightest to the heaviest. After the goods are stitched and inspected they are finished and sent down to the packing rooms, where they are laid aside under different order numbers until their respective orders are completed, when they again undergo an inspection, after which they are ready to be packed in cases and sent by rail to the different ports of shipment. 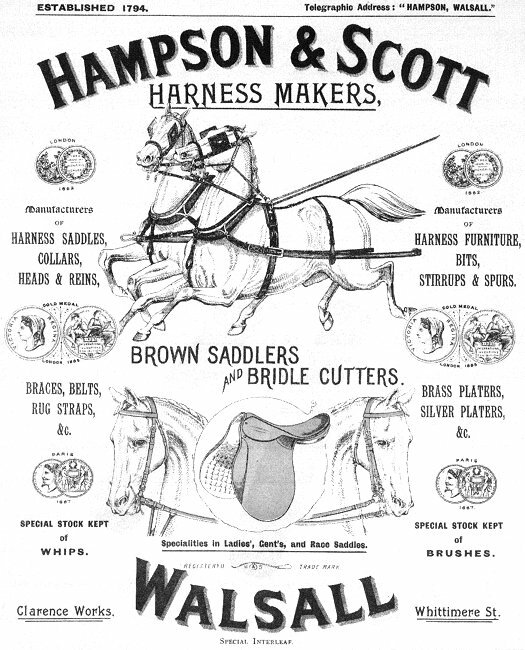 Among some of the articles produced here are bandoliers for South Africa, and eight mule span harness for the Transvaal, regular Cape harness for the Colonies, single harness for the East Indies and Australia, and mule harness for the West Indian plantations; whilst in the saddlery workrooms saddles are made of all styles, for almost every foreign market and for the Colonies, especially South Africa. In addition, some singularly built saddles have been made for South America, with the elevated Somerset cantles and thigh pads, as well as some high knee padded saddles for Australia. 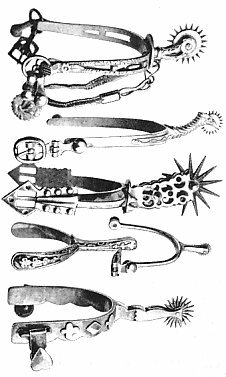 For the Kaffirs of the goldfields and elsewhere hundreds of grosses of money belts have been made for their arms, wrists, and waists. A large amount of work is done for the government, especially for India and South Africa. The number of workpeople employed is about 300. In the 1950s the industry suffered because of competition from products made of artificial leather. By the 1960s tanning was in decline, but over 600 people still worked in the industry. 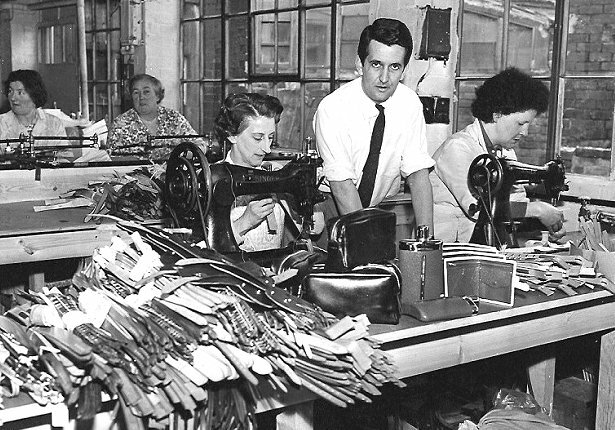 In 1970 there were around 50 leather goods manufacturers in Walsall, and the town produced around half of the British-made fancy leather goods. A small number of saddle and harness makers survived, producing high quality, hand-made items, mainly for the top end of the market. In recent times there has been a revival in the saddlery trade, which has ensured that Walsall’s saddle making industry will survive into the foreseeable future. More leisure time and televised equestrian events led to increased interest in horse riding for pleasure, and a dramatic revival of the quality saddle making industry. 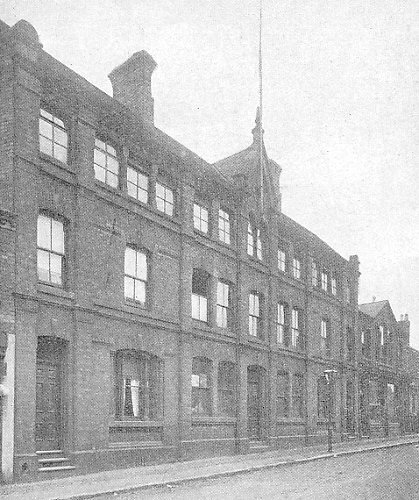 Imperial Leather Works in 1914, premises of Moss, Stone & Company. It is now occupied by Lovatt & Ricketts, and called Clifford House. Moss, Stone & Company of Imperial Leather Works, Butts Road was founded in 1898 by Mr. Alfred Moss. The firm manufactured saddlery of all kinds and specialised in light saddlery for racing, steeple-chasing, exercising, and polo, which was used in the principal races and polo clubs. Another product, solely manufactured by the company was the patent ventilated, extremely light saddle invented by Robson, of York. In 1913 the company acquired the old established business of the late Mr. Thomas Ash, Paragon Works, Walsall, together with the goodwill, patents, trade marks and manufacturing rights. The company also produced fancy leather goods including purses, pocket books, jewel cases, music cases, camera cases, attache cases, suit cases, watch guards, wristlets, braces and men's belts, blotters, dog collars, leads, and dog sheets. The firm was also a large Government contractor, making all kinds of military saddlery, harness, and equipment for the War Office, and patented a side saddle called the ‘Climax’, and a saddle called the ‘Eldonian’ which was bought by Jeffries in 1987. The London Offices were at 63, Queen Victoria Street. Harwood & Sons of Glebe Works, Glebe Street was founded in 1894 to manufacture high class leather goods. Products included American and English buggy saddles, harness collars, coupé saddles, rein holders, winkers, pad cloths, letter cases, purses, ladies' bags, dog collars, belts etc. The firm also carried out bridle cutting, and was a contractor to H.M. Government. Another manufacturer T. H. Crumpton & Company of 48 Stafford Street produced harnesses and claimed to possess the oldest harness factory in the world. The firm specialised in sweat-proof collars and sweat-proof lined saddles, and made every kind of harness, from dog and goat harness to elephant harness. A Stone & Roberts saddle. Stone & Roberts of 43 Wednesbury Road were a well known manufacturer of high class saddlery. 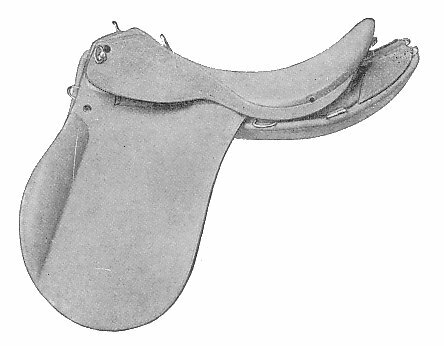 The firm designed and made saddles for military and other purposes, suitable for all climates. The saddles were sold at home and abroad, many going to India, Australia, and New Zealand. Finishing pig skin leather, ready for export. 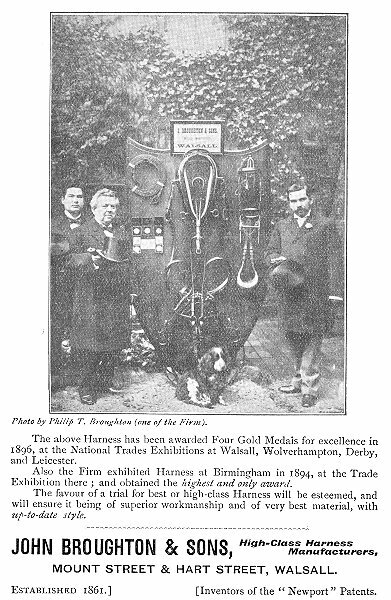 Today’s manufacturers include E. Hulme & Son Limited, the largest manufacturer of small leather promotional and advertising gifts in the country, Peter Yates Leathergoods Limited, manufacturers and importers of leather, and producers of a range of products including conference folders, travel wallets, and business accessories. Ancol make collars and leads for pet owners, using the best bridle leather, and Nevada leather goods produce the extensive Abbeygate collection of promotional diaries and striking leather gifts. W. Lees (Walsall) Limited is an established manufacturer of men's leather belts, and braces, serving both the wholesale and retail trade. 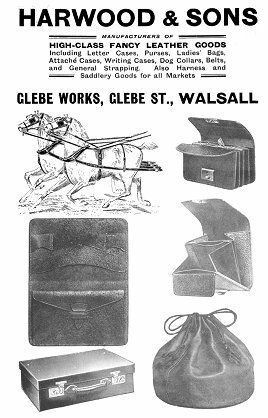 The firm, which became one of Walsall’s most successful, and longest surviving saddle makers was founded by Jabez Cliff, whose father George began his apprenticeship at a Walsall saddlery company in 1793. George lived with his father George senior, his mother Elizabeth, three brothers, and a sister in Badger’s Yard in Park Street where George senior made leather breeches in a small workshop behind his home. George began his apprenticeship at the age of 13 and learned how to make bridles. George later married and had several children, all except one dying young. The surviving son Jabez started his own saddlery business in 1873 when he founded Jabez Cliff and Company, in Portland Street, Walsall. Eight years later tragedy struck when Jabez and his two sons Samuel and George died in the terrible typhoid epidemic that swept across the country. Luckily his wife and daughter Mary managed to keep the business going. In 1882 Mary married Frederick Tibbits, a skilled bridlemaker who joined them in the firm. In 1902 their son Jabez Cliff Tibbits joined the firm. In 1906 he purchased J. A. Barnsby and Sons, saddle makers at Globe Works in Lower Forster Street. The two firms amalgamated and produced saddles under the Barnsby name, bridleware under the Cliff name, and created the saddlery brand of Cliff-Barnsby. The firm exported many of its products to Russia and Germany, but as the First World War loomed, Jabez realised that other markets, and other products had to be found. The firm them diversified into the production of sports products and leather goods, including cricket balls, soft-balls, golf bags, holdalls, leather cases and travel goods. The firm developed and patented a none-tear football which came to fame in four FA cup finals, and in the 1928 Olympic Games. In 1929 the firm exhibited basket balls, cricket balls, footballs, hockey balls, polo balls, tennis balls, volley balls, bowl bags, golf bags, sports bags, belts, dog collars, riding saddlery, and travelling requisites at the British Industries Fair. The company’s managing director Jabez Cliff Tibbits served on Walsall Council for Hatherton Ward. He was elected Lord Mayor of Walsall in 1939 and 1940, and became an Alderman in 1941. He also became a Justice of the Peace. An advert from 1974. During the Second World War the firm produced Bren gun pouches, webbing, and ammunition belts, and formed links with the military that would continue for years to come. The firm’s display at the 1947 British Industries Fair included Barnsby saddles, bridles, reins, head collars, Globe footballs, baseball balls, cricket balls, hockey balls, netball balls, rounders balls, water polo balls, leather travel goods, golf bags, and sports bags. In 1948 Jabez Cliff Tibbits, who lived at Cedar Court in Aldridge was knighted by King George VI for his services to Walsall, and became known as `Sir Cliff`. He died in 1974. During the Falklands War in the early 1980s the firm supplied the task forces with pack saddlery so that vital weapons and equipment could be transported by mules. For this work the queen awarded a Royal Warrant as Saddler and Loriner to the firm, which also supplied saddlery equipment to the Kings Troop, the Royal Horse Artillery, the Household Cavalry, the Metropolitan Police, the City of London Police, and also ceremonial equipment to countries throughout the world. The firm became one of the top five saddlery businesses in the world, exporting saddles and leather goods to many countries. In 2009 Jabez Cliff & Company Limited moved from Globe Works to new premises in Aldridge Road. It was the start of a new era. The buildings were officially opened by HRH the Princess Royal on Tuesday 21st September 2010, and the future looked bright. 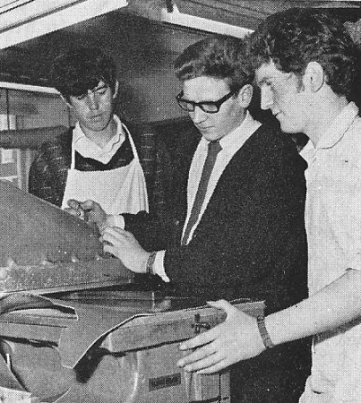 The firm was then to be known as Barnsby, and the new buildings were called Badgers Yard. In August 2011 tragedy struck at the firm’s old premises in Lower Forster Street which were destroyed by fire. The building had been earmarked to become a £3m health centre with two doctors’ surgeries, an optician and a pharmacy. Barnsby concentrated on sporting goods, saddlery and other fine leather goods, much of which was exported to the USA, Western Europe, the Far East, Africa, the Middle East, Australia and the Pacific Rim. Using a leather cutting machine. The firm’s saddlery was used by many of the leading professional riders, but by the beginning of 2014 things had started to go wrong. Seven people were made redundant from the sales department, the office, the factory and the warehouse, but the firm remained confident that profits would soon increase. The company’s creditors agreed to reduce their debts to manageable levels, and everyone worked hard to increase sales, but the bottom had fallen out of the market. On 17th June, 2014 the Birmingham Post reported that Barnsby has ceased trading due to a failed restructure and has gone into administration. The remaining twenty six staff were made redundant, and Andy McGill, partner at the Birmingham office of Smith & Williamson, was appointed as administrator. A very sad end to an old and well-respected firm, whose future had seemed so bright only a few years earlier. Sewing fancy leather goods. Courtesy of John and Christine Ashmore. Saddle makers include King's Saddlery, which is famous across the equestrian world, and Albion saddle makers who make a range of high quality products for horse owners. Another saddle maker is E. Jeffries & Sons Limited in Bridgeman Street. The business was founded in 1820 and has become a well known name in the horse world. The firm designs and manufactures saddlery, bridlework, and riding equipment using the latest technology and materials combined with traditional manufacturing skills and craftsmanship. High quality leather is still produced in the town. J & E Sedgwick & Company Limited was founded in 1900 by James and Emmanuel Sedgwick, who were later joined by Richard Farrow. The company is one of the leading suppliers of equestrian leather in Walsall and maintains an active recruitment and training programme for new young apprentices. These works were founded by the late Mr. John Dewsbury in 1840 in Duncalf Street, Walsall, and the increasing business was soon afterwards removed to Littleton Street. Here bridle bits are produced in all qualities, sizes, and patterns; among the novelties are bits made with India rubber mouthpieces for tender mouthed horses, the chains inside being tested to stand a pull of 500 lbs. ; and medicine drenching bits, by which medicine may be easily given to horses and cows. Besides the usual japanned, tinned, and nickel plated goods, bits in solid nickel silver are extensively made. In the new nickel plating process steel articles are placed in a perforated cage, through which runs a brass rod connected electrically by its bearings with the rods that suspend it; the cage is spun in the green solution of nickel, and as the articles jolt about inside they take on the metal and polish themselves against one another. Some bits are cast, but most are forged; and skilful work is required to snake the two halves of a light snaffle exactly alike. For making rings, a rod of steel is drawn from the forge, twisted round, run through a hole, welded, and moulded to shape with a few blows on a plug; the extra metal at the joint is removed by a file. The first polishing takes place in revolving cans amid sand and water or emery and oil; the last is performed on calico wheels with tripoli rubbed on from the cake. An interesting process is the making of moulds from the drawings. A piece of lead is carved to resemble the drawing as nearly as possible, from which a mould is taken in sand, and a casting made; the latter is then carved until it truly represents the drawing, and is then moulded, and another casting taken from it, which becomes the lead pattern for future use. The number of workpeople employed is 100. In 1971 the old established firm, Boak Currying Company Limited, was acquired by James Garnar & Sons Limited of London. The name of the company was then changed to Garnar Boak Limited. Mr. R. G. A. Boak continued as Managing Director, and new machinery and working methods were introduced to increase production. This enabled the business to extend its market share, particularly abroad. 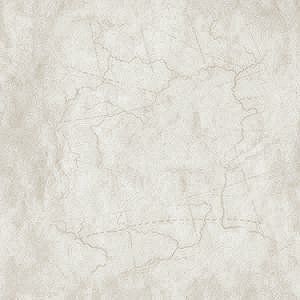 The high quality products include pigskin leather, hide, E.I. Kips and calf leather which is ideally suited for the production of saddlery, bridle, and fancy goods. 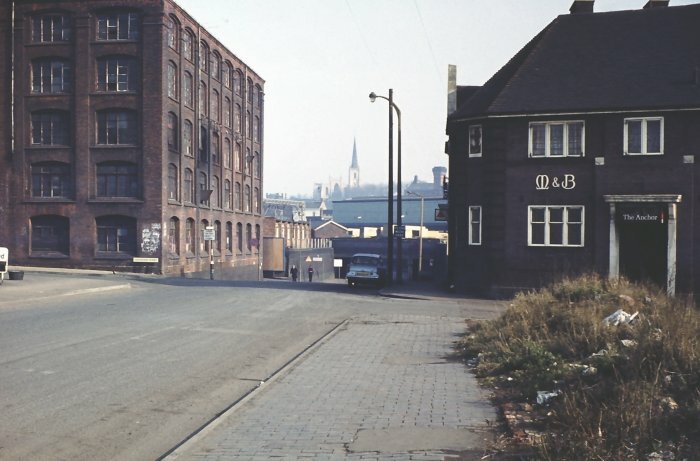 Garnar Boak Limited's factory can be seen on the left of Bridgeman Street, with the Anchor pub on the right. Sadly the factory was destroyed a few years ago after a mindless arson attack. Taken by Richard Ashmore. Courtesy of John & Christine Ashmore. Another successful business, the Vantage Leathergoods Company, founded in 1899, manufactures a wide range of leather products from many types of leather. The products, which carry the 'Vantage' trade mark, include ashtrays, billfolds, folio cases, brushes and brush sets, pocket flasks, key purses, manicure sets, notecases, shoe-shine kits, spectacle cases, stud boxes, tobacco pouches, travel slippers, wallets, wet packs, and writing cases. 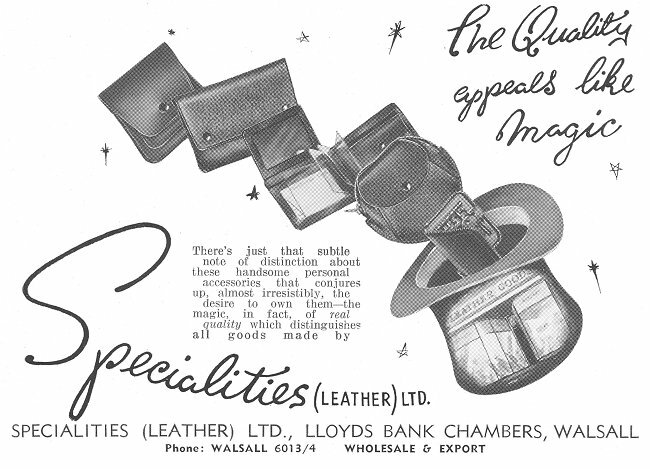 Specialities (Leather) Limited, founded just before the First World War, produced a range of purses, wallets, tobacco pouches, and shopping bags, etc. that were sold both at home and abroad. They also produced a range of novelty goods under the name of "St. Crispin". The firm initially had premises in Bridge Street, Walsall, but due to early growth larger premises were soon required and so the firm moved to Stafford, where it stayed for some time. Several years later a new purpose-built factory was erected at Goscote where goods were made on a conveyor belt system, the first time this technique had been used in the leather trade. All went well until the Second World War when the factory was requisitioned. In order to carry-on with production of fancy leather goods, the firm used other factories, some as far away as London. 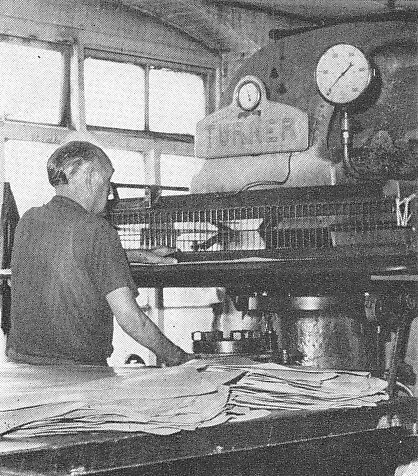 Although recovery was difficult after the war, the company prospered, soon producing a range of over two hundred items at four sites in Walsall, including a wide range of shopping bags.